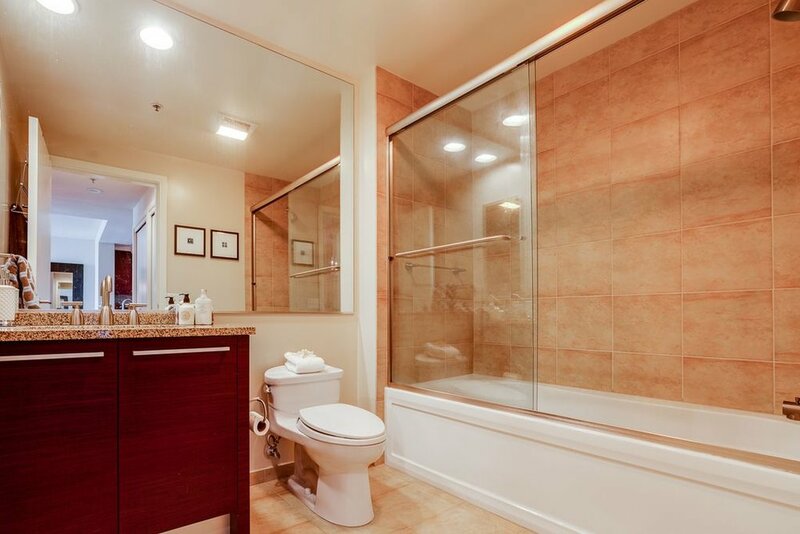 Spacious one Bedroom condo in Pacific Heights neighborhood. Newly remodeled tastefully furnished with high-end mid-century modern style furniture and decorations. Included one dedicated parking spot in private garage. SOMA/South Beach The property is situated next to South Beach and the Financial District and is just blocks from the Bay Bridge, Highways 101, 280, BART, and Caltrain. Its prime location provides easy access to downtown, East Bay, and the Peninsula. Many of San Francisco’s top restaurants, Union Square, AT&T Park, and the Ferry Building are mere blocks away. This exceptional well lit property is east-facing and sure to impress, with views of the Bay Bridge. This spacious 1 bedroom, 1 bathroom is the largest one bedroom floor plan at One Rincon Hill. This condo features floor-to-ceiling windows, a spacious walk-in closet, bamboo floors, and granite kitchen and bathroom countertops as well as designer Bosch and Sub-Zero appliances. In-unit laundry and valet parking for 1 car complete the home. The building is a late-modernist style high-rise condo tower designed by architectural firm Solomon, Cordwell, Buenz and Associates. The building soars 60 stories, and offers unparalleled vistas of the entire city of San Francisco. Ultra-luxury amenities set One Rincon Hill apart from all others, including a 24-hour doorperson; a concierge; full-service valet parking; a club-quality professionally equipped fitness center with steam rooms and showers; a full-size 73-foot outdoor pool with a soothing spa; a beautifully landscaped garden deck and large open grass area; a gourmet barbecue area with plenty of table seating to enjoy an afternoon lunch or dinner; an outdoor fireplace lounge with comfortable seating; and a reflecting pool with an infinity edge.